IFC Films has unveiled the full theatrical trailer for Wrong Cops, the third feature from "Mr. Oizo" aka French director Quentin Dupieux, responsible for Rubber and Wrong before this. Wrong Cops chronicles a group of cops behaving badly in a not too-distant future where crime has been all but eradicated. We've featured one early promo trailer for this before, and the film has been touring around to festivals, but this is the first real trailer we've had yet and it's extremely wacky and vulgar, but oddly kind of fun. The ensemble cast includes Marilyn Manson, Steve Little, Eric Wareheim, Jon Lajoie and many more. Enjoy this! Update! 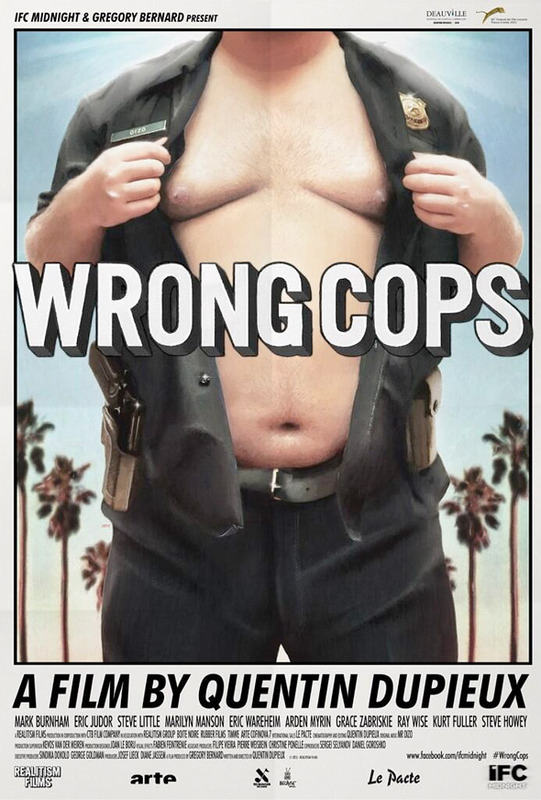 Added the official Wrong Cops poster below (which is just wrong) to go along with the trailer. Imagine a Los Angeles where crime is so low that a bored cop (Mark Burnham) sells drugs and harasses a teenager (Marilyn Manson) to pass the time. Shot in stand-alone chapters as it is being financed, screened, and released, Quentin Dupieux's Wrong Cops stars Mark Burnham, Marilyn Manson, Steve Little, Eric Wareheim, Grace Zabriskie and more. French filmmaker Quentin Dupieux (of Rubber, Wrong) wrote and directed the film, which has been screening multiple select segments at film festivals like Sundance. Wrong Cops will arrive in theaters and VOD starting on December 20th. For more updates, visit wrongcops.com. Hated this film. Trying so hard to be edgy and "offensive" it's annoying. Just looks stupid, not funny. Trying too hard to be funny and offensive and only really succeeding at being offensive.